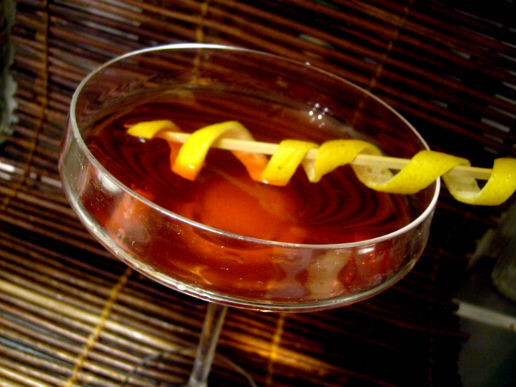 And not only that but it also uses a strong spicy bourbon while the classic Sazerac uses rye or cognac or both. I`m a huge fan of the Sazerac – THE quintessential cocktail of New Orleans, or shall we say one of them because we also got the Vieux Carrè, Ramos gin fizz, the Hurricane, the Crusta, the Frappè etc etc – but the Sazerac is and will always be the number one for me. And i`m an equally huge fan of Campari – since i was 15…. So here with this interesting twist of it….brought to my attention by Warren Bobrow ‏who invented it and wrote about it on his blog DrinkUpNY – i`m gonna make it here and spread it further because this is indeed a good cocktail. Chill a crystal glass (or other) with ½ shot of Tenneyson Absinthe, packed with ice and water, let cool for a bit then pour out – or drink up..
Rub the inside of the glass with a lemon zest – aah….the fragrance…. Add a sugar cube soaked in the Bitter Truth Creole Bitters to your glass and crush it with a wooden cocktail stick or a spoon or a muddler to release the flavors. Add the bourbon, campari and gin and stir with a lemon zest threaded onto a cocktail stirrer. This drink tastes like a spicy Sazerac with herbal/citrus notes and a touch of campari…it´s interesting…and definetily something to sip and savour. And why not put on some music with Louis “Satchmo” Armstrong while you sip on this drink named after him? 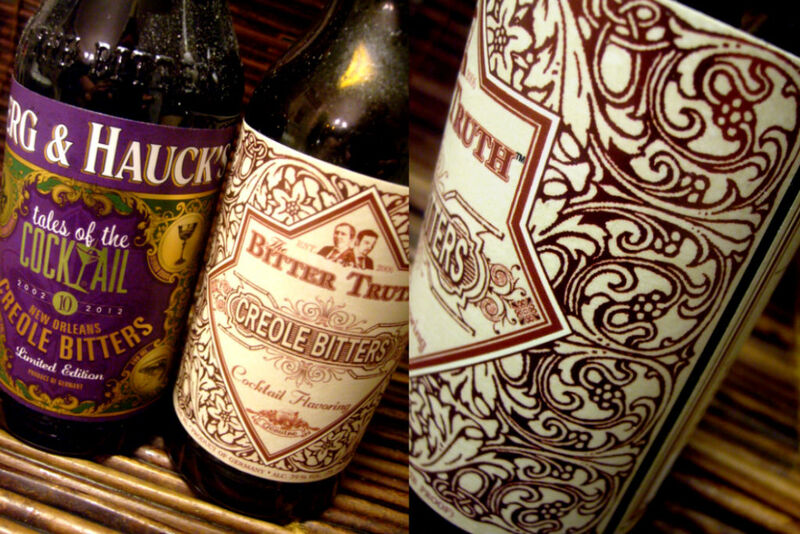 The Creole Bitters…the left bottle is the 10 year anniversary bottle that was sold at the Tales of the Cocktail this year in limited quantity and the right bottle is the ordinary Creole Bitters by The Bitter Truth. Both bottles contains the same bitters. 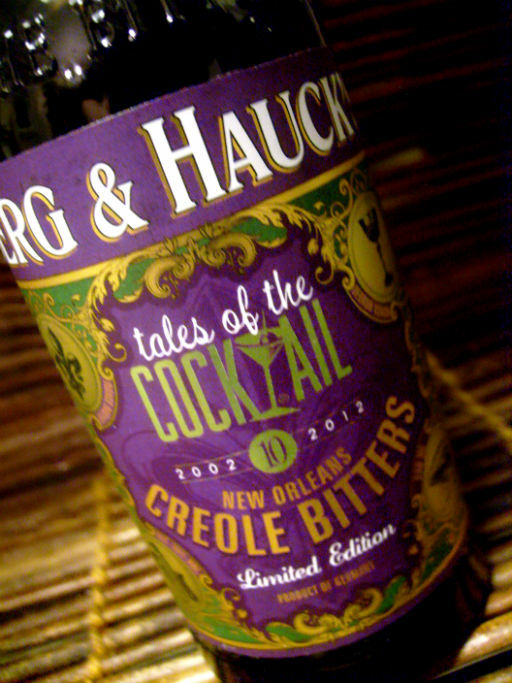 The 1o year TOTC anniversary bottle is a piece of art. This little cocktail is a strong fella that could wake up the dead..
It`s a very much New Orlean cocktail…combining all that which sums up the unique ambiance of this one of a kind city. Equal parts absinthe and vermouth paired with gin is what we have here in this old classic tipple which is the signature cocktail of the Lafitte`s Blacksmith Shop and is a brilliant twist of the gin Martini where the absinthe is King. 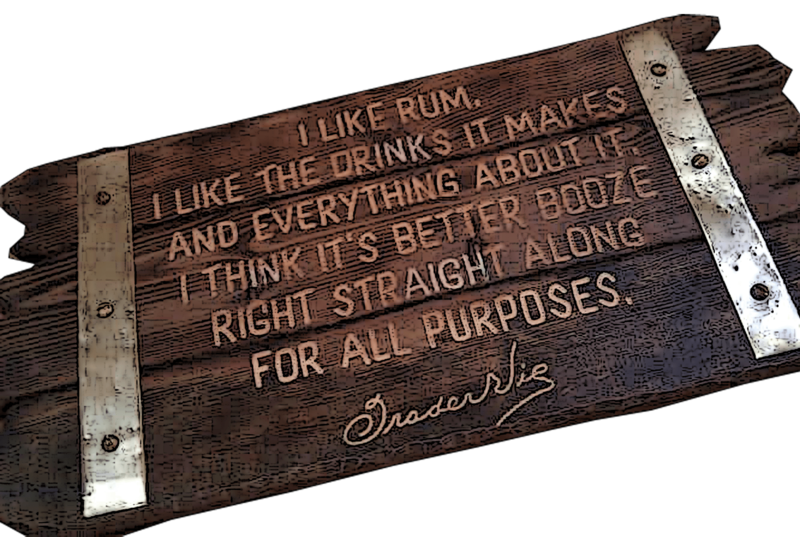 But it`s not just the spirits in this cocktail – it´s also the feel of it. If you have been to New Orleans and appreciate the city you know what that feel is all about. Alas this cocktail takes you back in time as does so much things in New Orleans, it takes you back to the dark foggy quarters in the 1800s. The name is not a nice one though, it means death and how come the cocktail got that name i have yet to find out, maybe it had to do with the ban of absinthe? However it does add to the mystery so let it stay that way, it´s part of its appeal. ” The book is written by New Orleans photographer Kerri McCaffety, a book i would like to get my hands on. I would recommend using real absinthe in this drink rather than herbsaint or pernod because of the prominent role absinthe plays here. With a substitute which you can use of course, it will simply become a bit too lame..so go get a decent absinthe for this cocktail. Chuck over at Looka/Gumbopages recommend Jade Liqueurs absinthes and when Chuck recommends something i listen – and so should you – trust me. I think i would like to try their Jade Nouvelle-Orléans absinthe Definetily on my to order list later this fall. Ice cold absinthe, vermouth and gin is perfect for the summer…i recommend two at the most. (no pun intended) The three ingredients balances each other perfectly here. 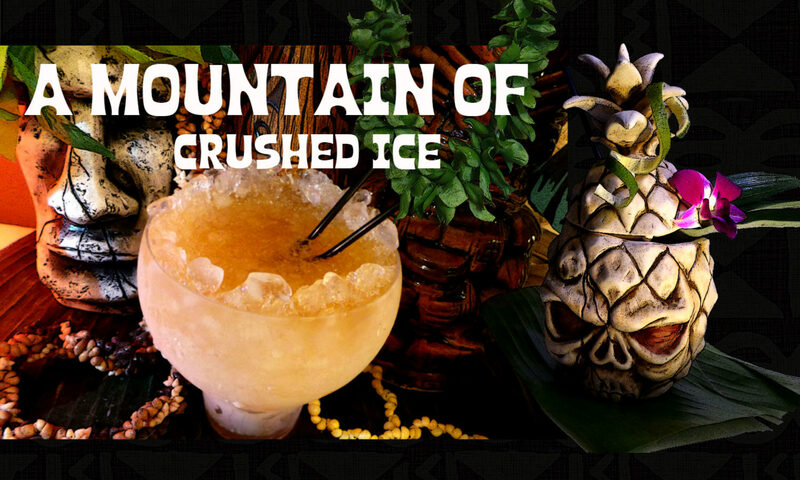 Pour the ingredients into a mixing glass filled with cracked ice. Stir well and train into a chilled cocktail glass. 12 Bottle Bar suggest you put both the mixing glass and cocktail glass in the freezer for at least 10+ minutes which to me is a very good idea since these kinda drinks really needs to be cold. Chuck recommends “Shake vigorously for 13 seconds, or stir vigorously for no less than 26 seconds” – Whatever way you choose to mix this up the important thing is to get it well mixed and cold. It does benefit from some dilution of the ice i think. This cocktail will of course look very different depending on if you use white or green absinthe. And now step back in time and enjoy one of the great classics. Mixology Monday XLVI – All About Absinthe! Time flies so fast that i did forget about the date and realized today that its time again for Mixology Monday…and how can i not participate when the topic is absinthe? The topic for February is Absinthe. That much maligned, misunderstood, mistreated spirit, suddenly plentiful again in the US and other parts of the world. 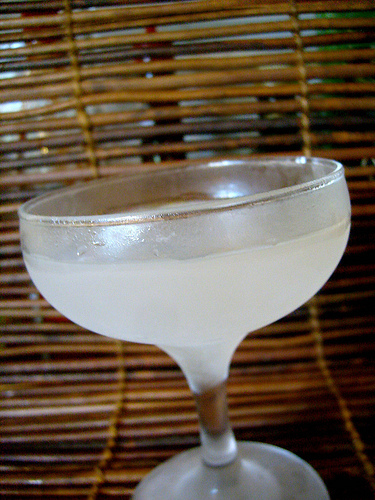 Absinthe played a role, whether large or small, in a variety of great cocktails from the 1800’s and early 1900’s – the Sazerac, Absinthe Suissesse, Corpse Reviver No. 2… I’m getting thirsty. So let’s celebrate absinthe’s history, and it’s future, with all manner of cocktails using absinthe. * Find or concoct a recipe using absinthe as an ingredient. * Make the drink and write about it. Include the recipe, ideally a photo, and something about how you liked (or didn’t like, or tweaked, or…) the drink. There´s one drink with absinthe that i really like a lot apart from the Sazerac which i`m addicted to, and that`s the Absinthe Suissesse. Its smooth like silk! so fluffy..and good for breakfast. Its actually a classic New Orleans breakfast cocktail originally made with Herbsaint and none could be better and more soothing than this one. But for this MxMo i wanted to make a twist of something and that something is of course the Suissesse. I really prefer the original recipe but now i`m gonna go astray a bit and change the drops of orange flower water for some Mozart Dry chocolate spirit. Then i turned down the orgeat from 0.5 oz to 1/4 and used 1 oz milk and 1 oz heavy cream instead of 2 ounces of the cream. I used one whole egg instead of an egg white, i think the whole egg adds more yumminess and roundness to this cocktail. Finally i garnished the glass with a rim of cocoa powder to accent the Mozart Dry. Mozart Dry is not a chocolate liqueur, its a chocolate spirit and its not on the sweet side, rather dry and very pleasant to mix with or on its own. Either you shake with crushed ice or you blend with ice cubes, i did blend this one. I also did rim the glass with some cocoa powder to accent the Mozart and make a garnish. I think Mozart Dry did very well in this cocktail, so well that i`m gonna use it more times in my Suissesses. Happy monday everyone and thanks Sonja for hosting! this drink is exactly what i needed today after coming back home from work turned into an icecube as that`s how cold it is here now. The Suissesse warmed me up! The theme for last week’s Thursday Drink Night was absinthe and sure there were both nano-drops and death pours made with our favorite louching spirit. As voted on by the participants at the Mixoloseum blog,the best cocktail of the evening will win a bottle of Marteau absinthe courtesy of Gwydion Stone. Lots of merry discussions along the night and many good laughs, we also had a few newcombers and that is always welcome! And no need to feel shy to join us in the chat room, its a fun and friendly crowd. Top with bitter lemon soda.Shake, strain,serve up in chilled cocktailglass.Garnish mint and liqorice stick. Stir with ice, serve up in cocktail glass. Garnish mint. 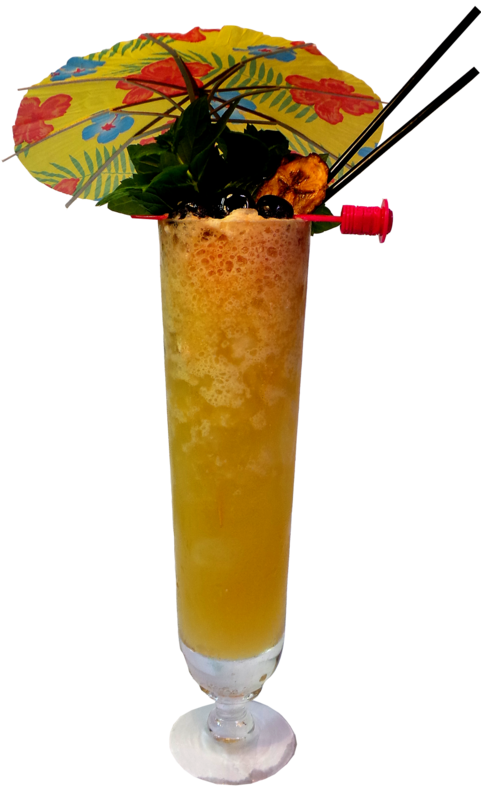 LA BELLE EPOQUE-ALYPSE (Drink made by Dr Bamboo –) here is another blog that is a must to check out, if you haven´t yet GO! Green cherry if ya got one. Shake and strain into a chilled cocktail glass. Garnish green cherry. Every week cocktail bloggers, bartenders, enthusiasts, experts, and novices get together for a virtual cocktail party mixing drinks in real time, tweaking, rearranging etc until the night is gone and well into the morning. Join us every thursday at the TDN! Mixoloseum is a creative place! Join us tonight for the next TDN which is swizzle! JOIN us this Thursday at the TDN ABSINTHE! Join us for this weeks Thursday Drink Night featuring absinthe. It will be fun, deadly, and Stutz-tastic! Also on Tuesday april 14 on Absinthe: A night with Gwydion, Paul, and Brian. Please join us Tuesday, April 14th, at 7pm (EDT) for a discussion of absinthe and its history, distillation, and current place in cocktail and popular culture. Gwydion Stone and Brian Robinson of the Wormwood Society as well as our own Paul Clarke will be our guests to share their expertise and passion. Every week cocktail bloggers, bartenders, enthusiasts, experts, and novices get together for a virtual cocktail party mixing drinks in real time, tweaking, rearranging etc until the night is gone and well into the morning. Its tons of fun! So join me and the rest of the TDN crew this coming Thursday april 16 – 2009 for TDN: Absinthe! Its not many absinthes you can buy here in my country (Sweden) in fact, there`s just ONE bottle in our state controlled liqueur shop an artificially brightly turquoise thing i never will buy, among all bad things i`ve read about it, it even lacks louche. Then we can special order 4 other brands but to very expensive prices. Now when i heard that la Clandestine is soon going to be sold here, it`s very good news. La Clandestine absinthe is the only absinthe that is hand-crafted in the village of Couvet in the Val-de-Travers region of Switzerland where absinthe was first born and is a 100% natural distilled absinthe free from artificial colour. The very first absinthe was born in Couvet in the 1790’s. The best absinthes in the 19th century were all produced in the area around Couvet (the Val-de-Travers) and then just over the French border in Pontarlier which eventually became the capital of absinthe production. When absinthe was banned in most of Europe between 1908 and 1915, the French (law abiding citizens!) stopped producing. In the year 2000 La Clandestine started to be made by Claude-Alain Bugnon who is born in the region and he was the first maker of absinthe from the actual birthplace of absinthe to go legal – that was in 2005, two hundred years after the first birth of absinthe, and Claude-Alain went legal labelling his absinthe La Clandestine to celebrate the heritage of Swiss absinthe freedom fighters. The first batch of La Clandestine was made in a simple 12 liter pot with a cooling device on a hotplate. Claude-Alain Bugnon gave up his job in industry to start making the local drink for his own friends in 2000. His reputation spread via the internet and his absinthes started to become famous (for American absinthe drinkers, that is). At the time, it was still illegal to produce absinthe in Switzerland and he risked a jail sentence, while fighting in his wife’s laundry for distilling space! Claude-Alain received his license after doing a series of experiments under the control of the authorities and his first legal absinthe was shipped to Germany in december 2004. The ban of absinthe was lifted in march 1st ending the 95-year ban. And since then it has developed throughout the world, its now sold in 11 countries, including the USA, Canada, Japan, etc. It has won many fine awards and finally reached my mailbox! What makes La Clandestine special? The plants that are used grow in the fields around the distillery. The combination of soil, topography and climate are ideal for the plants used in absinthe. There is a lot of difference in using fresh plants, rather than ones shipped across the world. La Clandestine is distilled in Couvet – the very birthplace of absinthe. At a time when “hand-crafted” could become a cliché, La Clandestine is very much a hand-crafted labour of love with the whole process from plant selection through distilling to bottling all done by hand. Claude-Alain is recognised as an amazing craftsman within the industry, having won the Golden Spoon at the Pontarlier Absinthiades for the last 4 years. I term this is the Absinthe Oscars since the winner is selected by a panel which includes his colleagues in the absinthe business. La Clandestine – the official flagship, launched to mark the Swiss legalisation of absinthe on March 1, 2005. With a recipe made up of more than 10 plants, it has, at first nosing, a wonderful richness of aromas, followed by a lingering light bitterness. This is the blue bottle with a blue label, slightly different in the US (750 ml) bottle, with a slightly different label. It has won first prize and “Absinthe d’or” at the National Competition for Swiss spirits on September 16, 2005 and Gold Medal in the same competition in 2007. 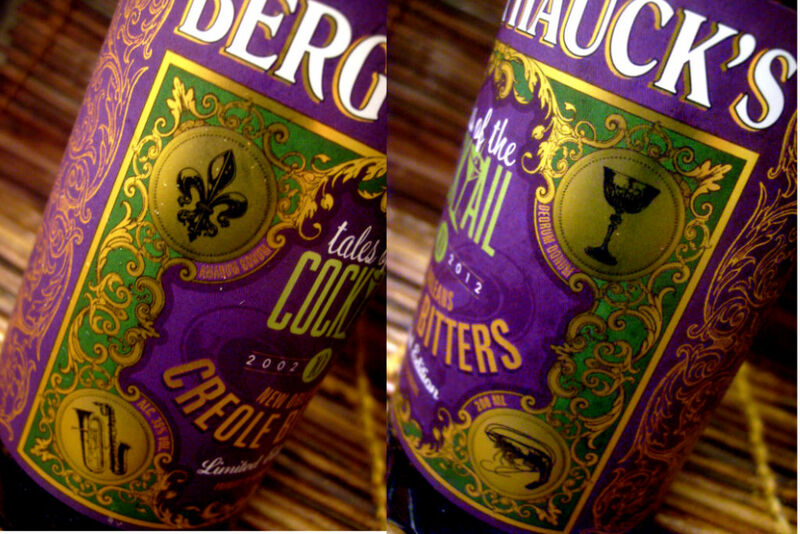 La Capricieuse – Comes with a green label and is stronger – 72% abv 144 proof- remining of the old days before the ban. Its based on the same recipe as La Clandestine. Recette Marianne – This absinthe was produced only 10 days before the French Absinthiades in Pontarlier, and was made to to conform to the strict French laws. Marianne was awarded the Golden Spoon of 2005, 2006, 2007 and again in 2008. Marianne has a sharper taste than La Clandestine Originale; less smooth and rather piquant and spicy, with a mild bitterness. Its 55% abv 110 proof. The bottle has a blue label. Angèlique Verte Suisse – The newest of the absinthes from La Clandestine and its a “verte,” or green absinthe. Angélique was created to meet the demands of some customers for an absinthe with a stronger but reduced anise taste. The colour, which is completely natural, comes from the maceration of wormwood in aromatic plants. After filtration, the macerate is added to distilled absinthe and the resultant blend is stored in wooden barrels to give it a light woody, more rounded taste. Its 72% abv 144 proof. I think La Clandestine has a great taste, it has a pronounced anise flavor but its not too overpowering and it has a nice little slightly bitter bite. It also has the same clean freshness in the flavor as i find in the nose. This is a nice product and i`m happy it will soon be sold in my country. 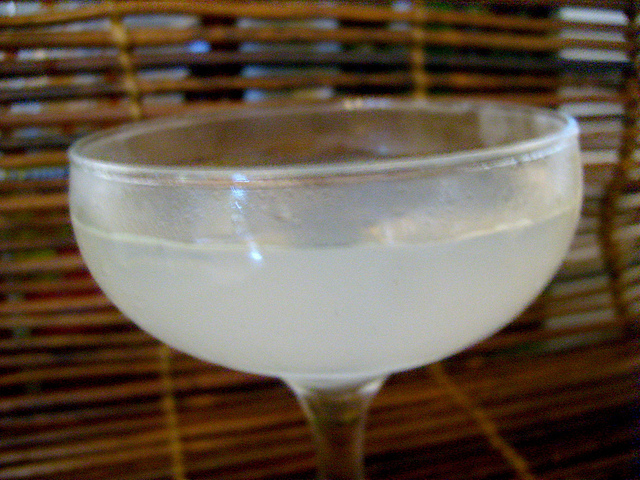 The first drink that came to my mind and which is a drink i like very very much is the absinthe suissesse, and i choosed a bit of a different take on this recipe which Rick over at Kaiserpenguin kindly gave me . This drink is smooth like silk! and a good first drink of the day. Shake with cracked ice long enough to get the eggwhite well mixed , strain into a chilled cocktail glass.